Twinkle: Twitter Client for your iPhone! What do you think of when I mention Facebook and MySpace? Do you get the shakes like a drug addict? Well, I hate to say it folks but the days of social networking are here to stay. What a wonderful world we live in now that we can follow the every move of our friends and family. Don’t you love classic Facebook status updates such as “Uncle Bob is washing his car” and “Billy can’t wait till it’s Friday”–awesome!! Anyways, one of the latest social networking sites to take the internet by storm is Twitter. If you aren’t on Twitter yet, you better get on it so you’re not left in the dark. Basically, Twitter is mini-blogging as you get only 140 characters to type. Your contacts can “follow” you and keep up to date with what you’re doing every minute of the day. Well, a Twitter application has now come to the iPhone. 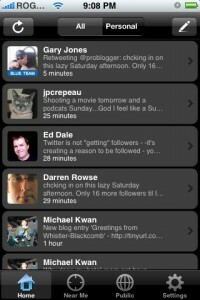 Today I’m going to review Twinkle, a recently released Twitter client for the iPhone. Twinkle lets you “tweet” (aka post a message in Twitter nerd-speak) from your iPhone. Let’s take at the program in more detail! 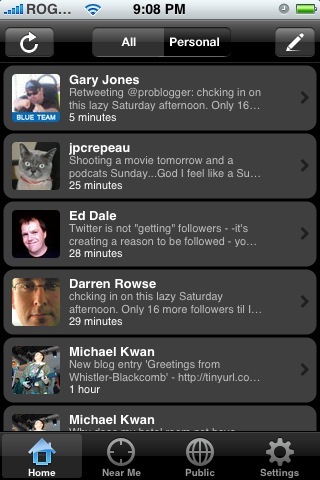 Twinkle utilizes the location features of the iPhone to add location info to your tweets. Moreover, you can find other Twitter friends within X miles–which could come in handy if your playing a game of city wide hide and seek. You can also “tweet” pictures taken with your iPhone’s camera. The application has a pretty aesthetically pleasing layout and is very easy to use. Step 2: The Sources will refresh. Go to Install. Choose the Network category. Install Twinkle. Step 3: If you don’t have a Twitter account, click here to sign up. Once you have your login credentials, launch Twinkle on the iPhone and enter them in. Step 4: Want to follow my every move? My Twitter URL is http://twitter.com/iphoneincanada … enjoy it while you can, stalkers! Reminder: iPhone in Canada Podcast This Sunday!